Qiita can be seen as an analytical pipeline broker that can apply any specific pipeline, tool, or script to any of its stored data. All the analytical pipelines are autonomous, independently developed, and tested, which facilitates the support of current tools and the development of new ones. This principle is supported via virtual environments and artifacts. Virtual environments for each pipeline gives the freedom of adding any pipeline with any software dependencies to Qiita. Artifacts, basically any file in the system, from raw sequence to contingency tables or even data visualizations, permits the system to store any kind of data but also define within each pipelines which commands and parameters can applied to them. Target gene processing via QIIME: sequence demultiplexing, and QC of SFF, fasta/qual, fastq and per sample fastq. Closed reference OTU picking. Qiita’s main entity is the idea of a study. A study can have many samples, with many preparations, that have been sequenced several times, Figure 1. Additionally, study artifacts have 3 different states: sandboxed, private and public. A sandboxed artifact has all operational capabilities in the system but is not publicly available, allowing for quick integration with other studies but at the same time keeping it private so the user can improve the analysis. Once a user decides that is time to make their artifact public they can request an administrator to validate their study information and make it private and possibly submit to a permanent repository, where it can also be kept private until the user wants to make it public. At this stage in Qiita the whole study (including all processed data) is private. This process is completely automatic via the Graphical User Interface (GUI). Currently sequence data is being deposited for permanent storage to the European Nucleotide Archive (ENA), part of the European Bioinformatics Institute (EBI). Finally, when the user is ready, usually when the main manuscript of the study is ready for publication, the user can request for the artifact to be made public public, both in Qiita and the permanent repository, Figure 2. Figure 1. Qiita’s main structure: from single to multiple studies. Increasingly, a simple study is composed of multiple samples which have been prepared using different protocols to identify different microbial features. For example, 16S rRNA amplification to identify the bacteria in or on the sample, metabolomics to identify chemical components formed by the microbial community or within the sample, and/or ITS amplification for identification of fungal organisms that may also be present. Additionally, Qiita allows users to compare their studies with other public ones already available in the system. Figure 2. Possible Qiita artifact states. Artifacts are any file, either uploaded by users or generated by the system. 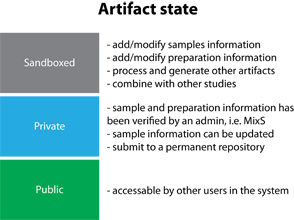 There are 3 possible states: sandboxed, private and public. In the sandboxed and private states no other user has access to the artifacts, unless the owner grants access by sharing the study. In the public state, the artifact is open to all users in the system, and the study can be found by searching from the study listing page. As seen in Figure 1 studies are the main source of data for Qiita, and studies can contain only one set of samples but can also contain multiple sets, each of which can have a different preparations. 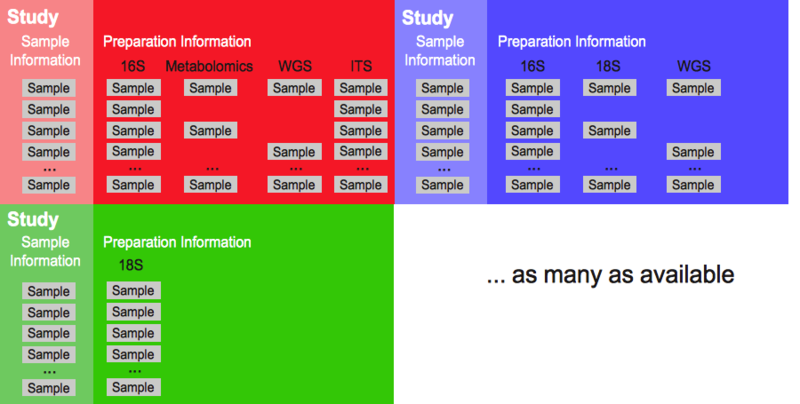 The traditional study design includes a single sample and a single preparation information file. However as technology improves, study designs become more complex where a study with a defined set of collected samples can have subsets prepared in different ways so we can answer different questions. For example, let’s imagine a study looking at how different microbial communities changes during mammalian corpse decomposition; thus, your full study design is to collect a set of samples, which you will then process with 16S, 18S and ITS primers. This will result in 1 sample and 3 preparation information files, see it in Qiita. the 2-3 fastq raw data files (forward, reverse (optional), and barcodes). NOTE: We currently do not have a processing pipeline for WGS but should soon. 1 prep information file. the raw data file(s) from the metabolomic characterization. NOTE: We currently do not have a processing pipeline for metabolomics but should soon. Qiita allows the hosting of multiple portals within the same infrastructure. This allows each portal to have a subset of studies (often with a similar theme) in a different URL but sharing the same resources. Sharing the same backend resources avoids having multiple sites and data getting out of sync.